In what can only be called a Turkey Day Miracle, Netflix and Shout! Factory have just revealed that Season 12 of Mystery Science Theater 3000 will be arriving in its entirety on that most hallowed of bad movie holidays: Thanksgiving. It will be one year to the day from when Netflix renewed the iconic movie riffing series, after it roared back to life following a 20-year hiatus. The returning MST3K experiment on Netflix was largely seen as a success, one in which the show went through some growing pains, very much as it did in the early seasons of its original incarnation. We ranked all the episodes of season 11 here, ultimately deeming the likes of Cry Wilderness and Wizards of the Lost Kingdom as series classics. 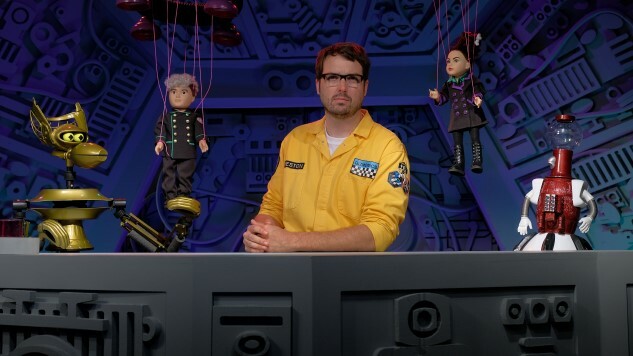 Here’s hoping that season 12 will continue to build on the successes of the first Netflix season, building an even better MST3K in the process. While waiting for the new season to arrive, you might be lucky enough to attend the soon-to-start 30th Anniversary MST3K live tour, which begins in Portland, ME on Oct. 9 and hits a bevy of major cities afterward. Tickets for the tour are available here. Also check out the press photo below, which gives us a glimpse of much-anticipated though rarely seen robot “Mr. Waverly,” as well as some spiffy (and presumably temporary) new bodies for the rest of the bots.